So I have had to shim a scope due to zero being too close to the top of the elevation adjustment, and now I'm zeroed about 10 clicks (Leica ERi with .1 mil clicks) and am curious if there's any harm in leaving it there? I believe that there's supposed to be some distortion when adjusted near the extremes, but I've just sighted in and not really looked carefully to see of I can detect any ill effects, what should I be lookong for? Also, will this in any way risk damage to the scope? I do dial for elevation. I do not go to the outdoor range in January, so serious testing will wait. Burris makes rings with plastic inserts that allow you to make cant adjustments with the rings. I think they are called signature series rings. They are designed for issues like this. Sometimes rifle actions are not really square and they can cause these issues. Sometimes it is the rings/mounts you are using. Whatever is causing the issue, these could help to fix it. As far as it damaging the scope. I would not worry about it, modern scopes this should not be to much of an issue. I have ran tactical scopes at the very edge intentionally to get my 100 yard zero with a 30 moa base so I could reach 1300 yards with a .308. It never caused issues with those scopes and image wise I could not tell a difference. What rifle is it mounted to? Knowing the rifle (and by extension, the mounts available for it) narrows down the solutions recommendations. I am not a fan of using shims except as a very last resort. If possible, using the Burris Signature rings ST recommended with the offset inserts is a great, "clean" option that doesn't risk stressing your scope tube. As RC said, a lot also depends on which direction you've run out of adjustment. If you're dialing, you never use elevation travel below your zero, so as long as you're not at the absolute travel limit, you're probably ok.
You sure the scope crosshairs have "settled" ? I have a VX1 2-7-33 that did that, and I had to run the knob all the way one way, then back all the way and then went back to about center to start with. I would not be able to handle that if I knew it was only 10 clicks away. I'm to OCD.  When deviating from the center area of adjustment in vertical, you lose horizontal adjustment ,and with Horizontal deviation you lose vertical. The top of a circle is not as wide as the middle. 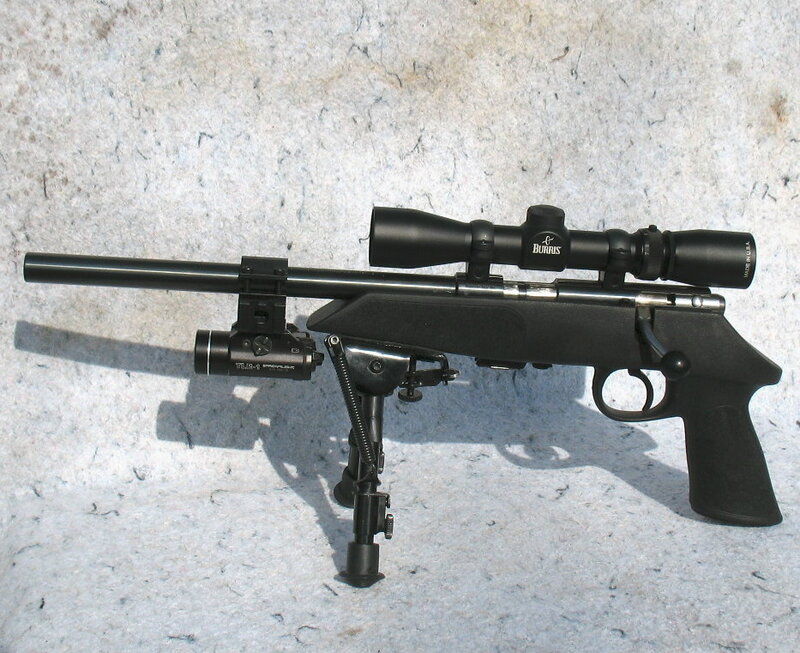 I've used Burris signature Rings before but this is a Sako 85. I've switched from the one piece ringmounts to the optilock rings amd bases as there was no easy way to shim the one piece mounts. Shimming the bases is also not an option, one bnb placed a modified washer between the rear ring and base. It's zeroed at the the bottom of the adjustment range, so I have approximately 15 mils of elevation available, but the turret only allows for 9.5 anyways. I'm certain the reticle has settled, I fired 20 rounds during my zero session, 5 shots to zero, and three 5 shot groups to confirm stability. - could this harm my scope. - will I notice increased distortion, or other negative optical effects. I won't likely shoot long range until at least May, and at the indoor range where I do my winter shooting I cannot detect any loss of optical performance. I'd be very surprised if you see any ill effects. (I set my Leica ER scope up that way intentionally using the Burris Signature Zee rings in order to have the maximum amount of elevation available, and have never noticed a problem with repeatability, box tests, or returning to zero after playing with the turrets.) How you set/leave the turrets should have no effect on optical quality or distortion. Some people are concerned with your scenario because it leaves the elevation springs sitting at/near one of the "extremes" in the adjustment range for extended periods of time. If that's a worry on your part, whenever you store your rifle set the elevation turret to a neutral position in the elevation range, and then when you go to shoot, return the turret to the zero stop. (The zero stop is a nice feature to have for that purpose.) Enjoy your scope! I've got an ER and ERi, and they are by far my favorite scopes. Its not going to hurt your scope. I doubt you will be able to notice any optical differences either, but it will be easy to check that one for your self. I have ran several scopes like that intentionally for a few thousand rounds and they were just fine. 3 IORs and a Vortex Viper, they all worked great in that regard. The question is acedemic now anyways, I've reduced the shim thickness and will sight in next week....I can only make use of 9.5 mils with my turret anyways, so having 15 mils available wasn't going to gain me anything. Next question. Knowing haow Optilock 2 piece mounts work, omce that ring screw is torqued down, do you think it will shift npw that instead of making contact with the base over it's designed bearing surface, it's only making contact via a much smaller washer. My thought is that there's not a lpt of chamce of it shifting, but the much reduced area of contact between ring and base has me a bit worried. The biggest problem with shimming you should be worried about is you have now made it so your rings are not in the same plane. Which in turn puts pressure on your scope tube when you tighten those rings down. That's possible it can cause issues with your scope, even damage. As Rifledude said, shimming is never a good idea. You are probably looking at something like this now. When tightened down it can literally flex yoru scope tube and then cause havoc with the internals of your scope. I use scope alignment bars to mount all my scopes. Since he's using the Optilock rings, that shouldn't be a problem since the "inserts" would prevent any misalignment, similar to the Burris Signature rings. I think any time you reduce the bearing surface area, you weaken the strength/rigidity of that link and increase the likelihood of movement compared to the design intent. The risk of failure is going to be different for each specific installation however, so you're pretty much stuck with trial and error to figure out if your installation works or not. If you're confident in how it went together, test fire it a bunch to build on that confidence and run with it. If the way you've shimmed it is always going to lurk in the back of your mind as a question mark though, I'd move to a different system now. not necessarily. Just because they have a polymer insert that does not correct them being in different planes from each other. Burris inserts create an angle in the inserts to create the cant. These are just straight inserts to protect the scope tube from getting scratched. It may soften the angle a little bit. But, when tightened down it could still cause issues. It may not see issues either, but I surely would not would to chance messing up a Leica scope. Just my opinion on this. Interesting -- that's good to know. The pics I saw of the Optilocks looked like the inserts had a convex surface to allow them to handle misalignment. Thanks! The optilock insert do on fact have a convex surface that mates with the concave of the rings. They are also slightly wider than the rings and protrude slight from the rings, pretty much exactly like the Burris posi-align or whatever that they use with their signature line of rings. I have used the Burris Signature rings, and even tried to fit their inserts into my Sako ringmounts, but they are sized differently. The Sako inserts are one piece with though, not two halves like Burris, and the Sako insert seem like a nicer plastic than the hard and shiny Burris inserts. I do not believe that this is the case as the inserts will rotate within the rings to align with the scope tube. I do have a 30mm lapping bar and know how to install a scope in conventional rings, but my understanding in that the design of the insert nullifies and misalignment in the actual rings, as the inserts rotates in the rings in a similar way to a ball in socket type joint. BUrris inserts you can buy different ones that are offset so you can correct out of alignment rings. That is the purpose of those. (which you have now created with a shim) I believe the posilock inserts are simply to keep the rings from touching the scope tube. I will stop with my comments at this point, as it is your scope and you can do as you wish. But just something to think about. Burris sells the offset inserts seperately if you need to add elevation or windage adjustment, the ones that come with the rings are zero moa and do not chan ge the point of aim of the scope. The Sako insert are of the exact same type, except that they have not seen fit to market inserts designed to adjust the point of aim of a scope....don't ask me why, as in every other way the Sako and Burris systems are basically identical. My understanding, and I may well be wrong, is that the inserts protect you scope from damage by misaligned rings, and the ability to intemtionally misalign you rings through the use of different sized inserts is a side effect that has been realised and capitalised on by the clever folks at Burris. Maybe that was the whole point of the inserts from the start, I dunno, but I do believe that Sako had inserts before Burris did, so they may have gotten the idea from Sako and expanded on it with the offset inserts. Now if you use the Burris offsets, you sre basically misaligning your scope tube with the rings anyways, I don't see how it's different than shimming rings as one of the most popular uses of the Burris inserts is to compensate for rings that are misaligned due to badly drilled scope mount holes, etc. anyways. I do not belive that Burris market their insert as a way of gaining elevation for long range, but as a way of bringing a wayward scope to zero. I do apreciate your input, and am not a stubborn guy. If I'm wrong on this I would greatly appreciate being corrected, I'm just explaining why I thought it was okay to shim by rear ring in the first place as I wouod never have done so with conventional rings. Ok, I will go a little more. With the burris zee rings you put the canted inserts in both the front and back rings to correct the issue. Or to create the cant you may want. In your case you created a raised back ring. Not a canted ring, but a completely raised ring that is in a different plane than the front ring. That is the difference. A slight ring misalignment is likely different as well. But then again, maybe yours is so small the polymer inserts correct it. Again, this is just all something to think about. Consider buyin the wheeler scope mounting kit. $50 and the you know for sure how much of a misalignment you may have. On an expensive scope, it is pretty small insurance plan. I don't have the wheeler kit, but I do have some of their tools for scope mounting. I have lapping bars, alignment bars, reticle levels, torque scree driver, etc. I don't see how you can use the alignment bars with the scope inserts though, they won't fit in the Rings without the inserts, and with the inserts they are basically held in a ball-and-socket joint and will align just fine regardless of the actual scope ring alignment. Of course, I have not confirmed this by actually trying it, but I can't possibly see how they wouldn't align since the ring inserts can pivot freely. I forgot to say, when I last used The Burris inserts I don't recall having to use them in both the rear and front ring. He's being a little while but I tend to follow manufacturers directions with this sort of thing, and I'm pretty sure if you need five MOA of adjustment you can just use the inserts and either the front or rear ring to achieve that, I know you can use to 5 MOA rings to get 10 MOA of adjustment by using one in the bottom of the rear ring and one in the top of the front ring for example. 10-4. Maybe i am all wrong then.